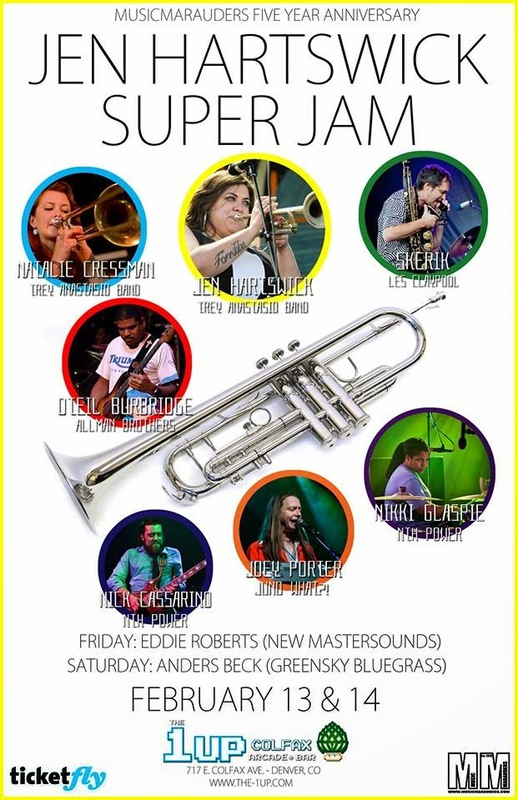 Join us on Friday February 13 and Saturday February 14 for MusicMarauders' Five Year Anniversary with Jen Hartswick (Trey Anastasio Band) Super Jam feat. 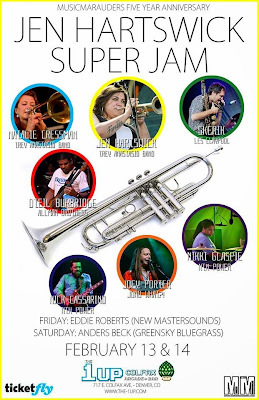 Natalie Cressman (Trey Anastasio Band), Skerik (Les Claypoool), Oteil Burbridge (Allman Brothers), Joey Porter (The Motet, Juno What), Nick Cassarino (Nth Power) & Nikki Glaspie (Nth Power) with special guests Eddie Roberts (New Mastersounds) and Jaden Carlson Band (Friday) and Anders Beck (Greensky Bluegrass) and Genetics (Saturday) at The 1up - Colfax in Denver, CO! Tickets for both nights are available for purchase at www.the-1up.com/listing for only $15.00 per night in advance!